We’re not following the calendar today, but digress a bit for some interesting observations. Funeral sermons often offer great insights, yet are some of the most overlooked reading around. Today’s post comes in the context of the history of the Reformed Presbyterian Church, General Synod, a small denomination that eventually merged with another and whose churches still later came into the PCA in 1982. The words here are drawn from the opening words of the Rev. 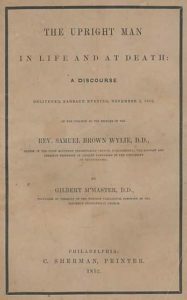 Gilbert McMaster’s discourse, The Upright Man in Life and Death: A Discourse delivered, Sabbath evening, November 7, 1852, on the occasion of the decease of the Rev. Samuel Brown Wylie, D.D., pastor of the First Reformed Presbyterian Church, Philadelphia; Vice-Provost and Emeritus Professor of Ancient Languages in the University of Pennsylvania. There you have a brief description of Dr. Wylie [1773-1852], while Gilbert McMaster [1778-1854] was an Irish immigrant who had been headed toward a career in medicine, when Samuel B. Wylie and Alexander McLeod convinced him of his call to the ministry. Pursuing that call, upon ordination he was installed in what used to be termed a yoked pastorate, over the Reformed Presbyterian congregations of Galway and Duanesburgh, in New York. He died not seventeen months after delivering the funeral sermon for Dr. Wylie. Their counsels give wisdom, character, and influence, to the Church with which they are connected, and power to the Commonwealth to which they belong. And not only their counsels, but their warnings against evil and against danger, and the example of their lives confer benefits upon all with whom they are related. The influence in the social state that attaches to the friends of God is mighty. Their prayer of faith, sustained by the divine promise, brings down from heaven the almightiness of God, in behalf of that in which it I presented, before the throne of mercy. It was not without reason, that an impious occupant of a throne feared the prayers of a distinguished man of God, more than an army of ten thousand men. When God in his administrations, comes and removes such, either from His Church or from the Commonwealth, it may often be understood as a frowning providence, carrying with it His rebuke; but if not a frowning rebuke, it is a most serious admonition, tendered to those who remain. The latter is the light in which the mournful occasion of our present meeting is contemplated. “The righteous perisheth, and no man layeth it to heart.” [Isaiah 57:1] No man layeth it to heart as he ought to do; “none considering,”—few considering duly—“that the righteous is taken away from the evil to come,”—taken away from present evil, and taken away from coming evil. It has often been remarked, that good and distinguished men, in the providence of God, were taken away before great calamities were inflicted upon their countries, or upon those with whom they were associated. “The righteous perisheth, and no man layeth it to heart.” There is a doctrine here—which as Rev. McMaster notes, few duly consider—namely “that the righteous is taken away from the evil to come,” which is both to say that death in every instance take us away from present evil, and that in some particular instances, the deceased are taken away from coming evil. In the text above, Abraham serves as his example, while others could be added to the list. McMaster goes on to note that “It has often been remarked, that good and distinguished men, in the providence of God, were taken away before great calamities were inflicted upon their countries, or upon those with whom they were associated.” That last point particularly is what has to be handled carefully, but yet there is a truth in what he says. It is a truth spoken of elsewhere by others, but time does not permit putting additional examples before you just now. Something to ponder perhaps, as we continue to study God’s providence. A: God’s works of providence are, his most holy, wise, and powerful preserving and governing all his creatures and all their actions. Psalm 145:17. The Lord is righteous in all his ways, and holy in all his works. Psalm 103:19. The Lord hath prepared his throne in the heavens; and his kingdom ruleth over all. and Matthew 10:29-30. Are not two sparrows sold for a farthing? and one of them shall not fall on the ground without your Father. But the very hairs of your head are all numbered.